The Turkish leader has been using clips from the attack to denounce Islamophobia ahead of March 31 local elections as he tries to stoke nationalist and religious sentiments. 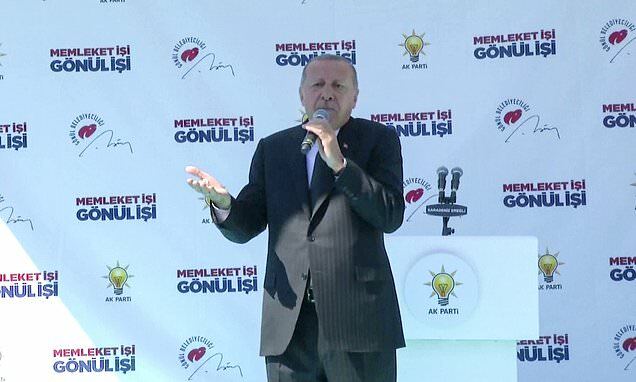 Speaking at the northern town of Eregli on Tuesday, the president called on New Zealand to restore the death penalty for the gunman who killed 50 people at two mosques on Friday. 'If New Zealand fails to hold the attacker accountable, one way or another we will hold him to account,' he said. 'There are no sentences longer than 15 years in our laws,' he continued. 'What are you saying? [Someone] is going to slaughter 50 Muslims who are worshipping, and there's no such article in your laws? Erdogan also took aim at New Zealand and Australia for sending troops to Turkey in the World War I Gallipoli campaign, claiming their motive was anti-Islam oriented. The president has been criticised for exploiting the video footage even as authorities have cracked down on the internet and social media to stop the clips from spreading. Facebook announced on Tuesday that the livestream was viewed less than 200 times live and 4,000 times in total before it was removed.